It is said that the most successful partnerships don’t rely on a singular common goal, but work together continuously on a shared path of equality, desire and passion to achieve the very best results. 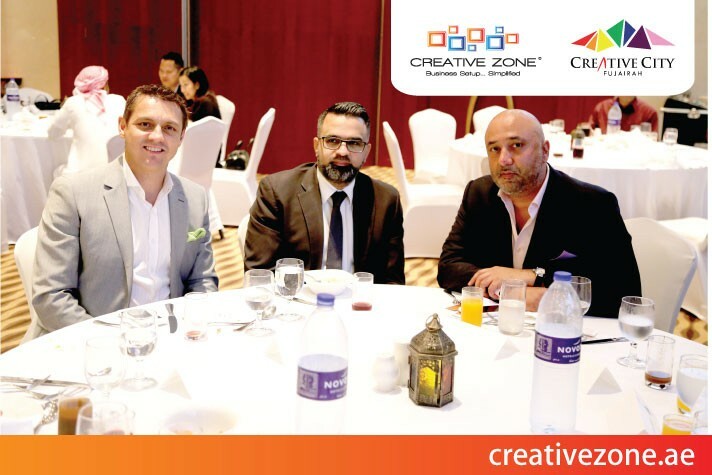 It was in the same spirit of partnership and friendship that brought the entire teams of Creative City Free Zone and CREATIVE ZONE to Fujairah recently, joining together for their annual Iftar dinner. Fujairah located on the East Coast, is one of the seven Emirates in the UAE. Long recognized as a preferred tourism destination, Fujairah is now a rapidly growing business, technology and innovation hub. Fujairah enjoys a strategic geographic location with access to major maritime and airport facilities, supported by modern and efficient governance. Under the leadership of His Highness Sheikh Hamad Bin Mohammad Al Sharqi, the Ruler of Fujairah and Supreme Council member, Fujairah continues to experience positive economic and social development. Creative City Free Zone, aided by Dubai-based business setup advisory firms like CREATIVE ZONE has worked hard to drive regional commerce and attract foreign investors to the area, which has positioned Fujairah as an ideal destination for investment and business. Creative City Free Zone Managing Director, Amged Badr Kamel expressed a positive outlook for the continued growth of the region, crediting the support of partners such as CREATIVE ZONE. "When reflecting on the recent Iftar shared with the respective teams from Creative City Free Zone and CREATIVE ZONE, I was left with a sense of pride and optimism for the future,” he said. “We are unified in promoting the wonderful Emirate of Fujairah and will reap the rewards of our combined efforts." CREATIVE ZONE Managing Partner, Mahesh Dalamal paid homage to His Highness Sheikh Rashid for his great leadership and vision. Mr Dalamal also gave credit to the strong leadership of locally based organizations such as Astral and Fujairah Culture and Media for implementing several practical programs to promote the region. “We are so pleased to be part of the growing success of the emirate and look forward to playing an important role in continuing to stimulate the flow of Investment into Fujairah and to give Fujairah and Creative City the global exposure and recognition it truly deserves,” he said. CREATIVE ZONE is a team of company formation specialists who are a respected leader in the UAE business setup industry. Having successfully setup thousands of companies since their inception in 2010, CREATIVE ZONE understands and appreciates the challenges and concerns people are faced with when trying to incorporate a new company in a foreign country. CREATIVE ZONE not only specialize in the handling and processing of all company documentation (everything from trade licenses to residency visas) but they also provide a business support platform of the highest caliber to their clients, helping them start their businesses off on the right foot. CREATIVE ZONE's expertise lies in the establishment of Free Zone, Dubai LLC & Offshore companies which in turn, allows entrepreneurs and start-up companies to focus on what's most important; starting their business and making it a success!